Things to Consider Before Starting Your Deck Project | 41 Lumber - Serving Iron Mountain and the U.P. Before you buy tools or any other materials to build your deck, the most important step you must take is to check with your local building authority to determine if you need a building permit. Learn the specifications allowed by your local building codes for support posts, beam and joist sizes, and railing styles. You many think these codes are not needed but following the codes will ensure your deck is properly structured, safe, and a valuable addition to your home. The second thing to consider is whether to use piers or posts. There is no right or wrong answer, but you have to decide whether you want to use deck piers or sink the wood post directly into the ground with cement. Each method has its benefits and your local building codes may also have a say in this matter. If not, choose the method that works best for you. If you live in colder climates, be sure to keep the pier pads below the frost line. This is important because if your pier pads are above the frost line, your deck can heave up and drop as the ground freezes and thaws several times during the winter months. This up and down can cause warping, twisting, and loosen boards, causing damage your deck over time. Next, you should give some thought to the floor frame. Decide whether or not you will have a ground level deck or one that is elevated. Similarly, consider the indoor/outdoor threshold. Remember, people are used to a step when they walk outside or no step at all. Therefore, always build your deck level ½” below your doorsill or a full 7” step. If you build it 2” or 3” you will trip everyone who uses your deck! When you finished the floor framing, check the spacing of your deck boards. Beginners often space their deck boards too far apart, causing huge gaps and a lot of lost dining utensils and loose change. What most people do not know is that most decking is ‘green.’ This means that when wood is delivered to you it is not dried. When the wood finally dries it will most likely shrink which can cause the gaps to be larger than you think. 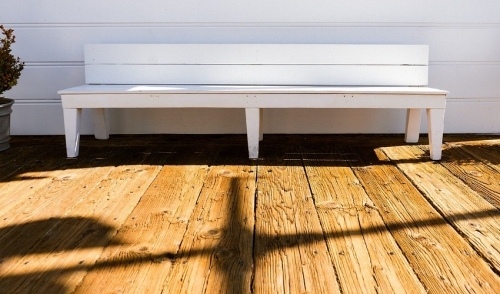 These are just a few details to keep in mind when starting your deck project. Have fun with the process! A deck is always a great addition to your home.